There's something comforting about rituals. Pasang Tsaga knows this very well. Every time she opens the Jewels of Buddha, she lifts the gate, lights the incense and turns on the meditative chanting music. Pasang was born in Tibet. With these practices complete, she stations herself behind the counter. She claims she is not interesting, but it turns out she has a lot to say anyway. Her story is long and winding like a road with many dead ends. There are things she can't remember or that are buried by time. She's learned to live with the mysteries. 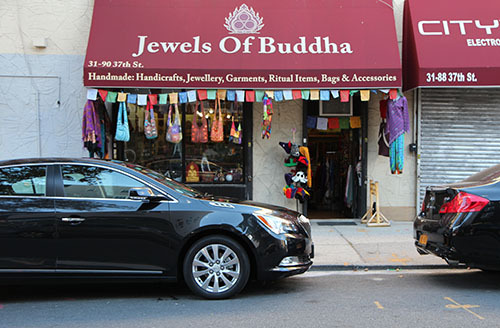 Jewels of Buddha is on 37th Street at Broadway. If there are parts that are sad and hint at hardship, Pasang skips the details, as if not talking about them will drive them from her mind. Her English is far from perfect, so she has asked her nephew, Sonam Lama, to serve as her translator. This is a good thing because up until recently, Sonam was the face of Jewels of Buddha. 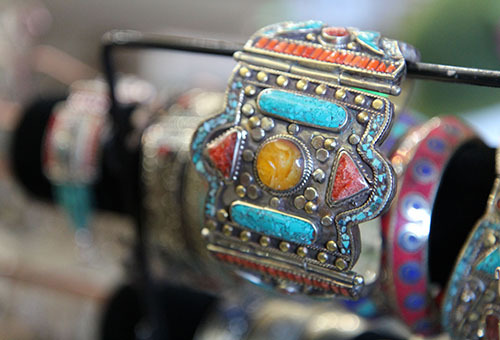 He can shed light on its history as well as its extensive inventory, which ranges from turquoise rings to wooden masks. 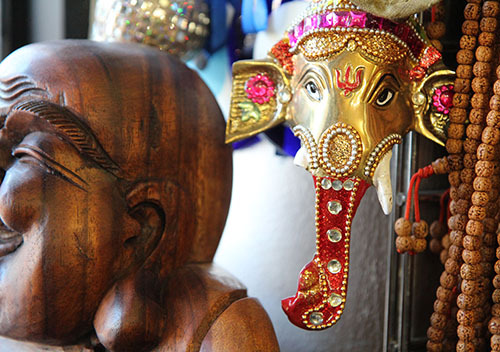 The shop sells handcrafted items from Southeast Asia. Pasang, a petite and polite woman who keeps her long black hair harnessed in a loose ponytail, is merely filling in while her brother Tashi Dawa, the owner, is back home in Nepal taking care of another business. Between the earthquake and the protests, his return has been delayed. Actually, home is not Nepal. 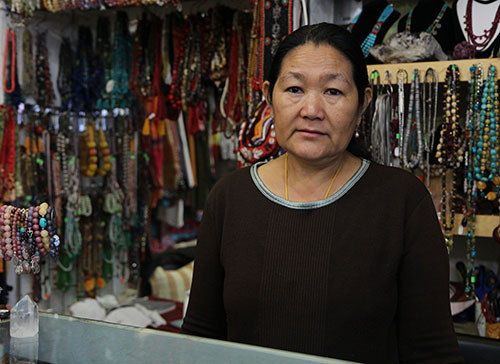 Pasang's family is from Tibet, a country that Pasang barely remembers. She knows that her parents raised cattle and food crops in the remote village of Chungpa Chunggor Dzong, which, in those days, was reachable only by horse. 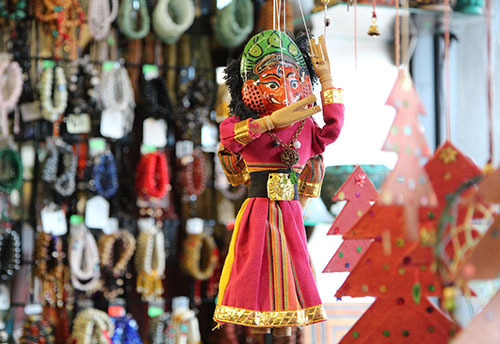 A handcrafted puppet hangs in the window. That's why it took the Chinese so long to take it over. Although the army invaded Tibet in 1950, troops didn't reach Chungpa Chunggor Dzong until 1959, when Pasang was 2. By that time, Pasang's father had left to join the resistance. When he did not return, her mother took Pasang and her five siblings to Lhasa to look for him. They did not find him, and they never found out what happened to him. Sonam, Pasang's nephew, used to work in the shop. Conditions were dire, so the family made its way to Nepal. "It took us a couple of months of walking through the jungle to get there," Pasang says. "One brother and one sister did not make it. They became separated from us. To this day, I do not know what happened to them." 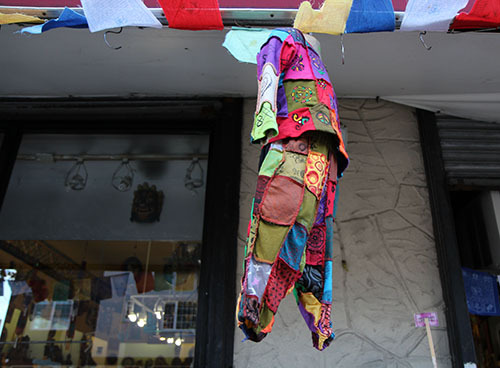 A colorful outfit waves in the wind. 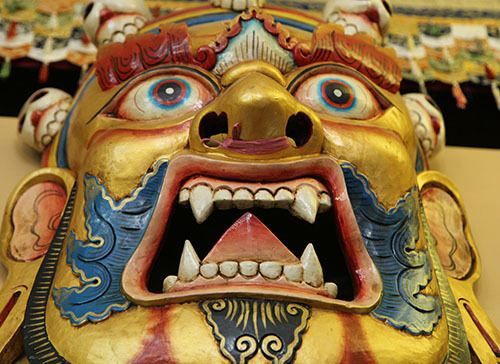 They ended up in Solukhumbu, where Mount Everest rises, then Helambu, where they took sanctuary in a Tibetan monastery. "My mother got a job doing the offerings and cleaning there," Pasang says. "We are Buddhists, but it was hard because we didn't know the language." Yet they stayed more than a decade before moving to Kathmandu. She's filling in for her brother Tashi. "We left the monastery because my brothers and sister and I didn't have any skills or schooling," Pasang says. "Through a government program, we were trained to weave carpets. I was 14, and my sister and I worked so my brothers could go to school." At 20, she married a man twice her age. 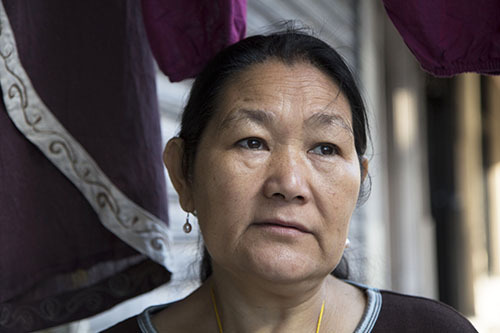 Her husband, a Tibetan monk who was arrested for protesting against the Chinese, fled to Nepal to escape imprisonment. They opened a deli in Kathmandu and had five children. 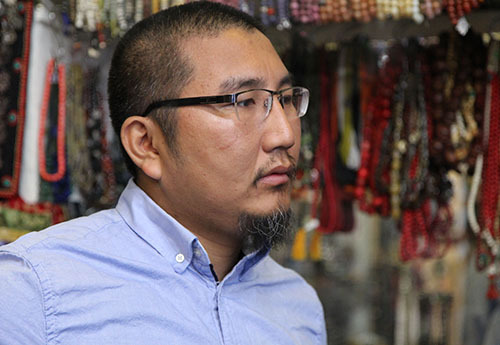 In 1998, after working hard and saving much, Pasang came to New York. She worked seven days a week, as a housekeeper then as a home-care aide. The shop carries a variety of silver jewelry. By 2003, she had enough money to send for her children. Her husband remained in Nepal to care for her ailing mother. He joined the family two years ago. "We have to take him everywhere because he doesn't know English, and he doesn't know his way around," she says. Pasang and her husband live with three of their children, two grandchildren and a niece in a small two-family house in East New York, Brooklyn. "We worked hard, hard, hard so we could buy it," she says. When Tashi needed help running Jewels of Buddha, which opened in 2008, Pasang and other family members volunteered. 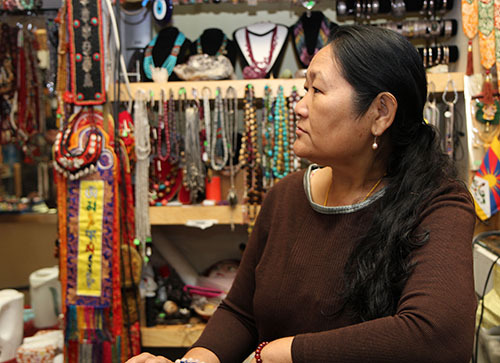 Until recently, Sonam, who immigrated in 2003 when he was 19, worked in the shop full time. The shop specializes in the art of Zen. He married a customer and after his son was born, he started driving a taxi, a job that comes with more money and flexibility. "I'm very proud of my mother and my aunt," he says, smiling at Pasang. Pasang hopes Tashi comes back soon, but she knows he won't stay. He's more interested in buying merchandise than standing behind a counter. Pasang is proud to be an American citizen. 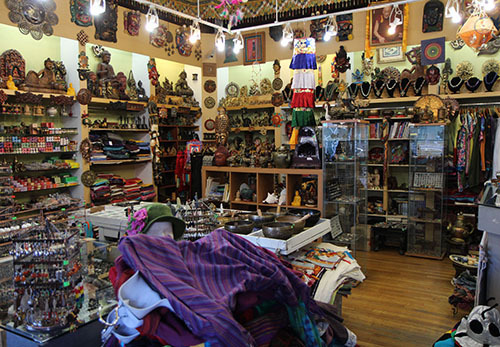 The shop, which is as calm and eclectic as a Tibetan temple, is filled with items from Nepal, India, Tibet, Pakistan, Afghanistan and Thailand that catch Tashi's eye. Pasang points to a row of crystal bracelets. She strings the shiny, round beads. She has something else to say, and this time, she uses her English, not Sonam's. "Thank god we did hard job," she says. "We are very happy in America, and I'm happy to be a U.S. citizen. I do not have to fear for my life, and I can make it better." Nancy A. Ruhling may be reached at Nruhling@gmail.com, nruhling on Instagram.